Behold the glorious sight of the glittering Andaman Sea! Guests at Villa Baan Taley Rom will enjoy unobstructed views of the sweeping coastline, for the villa occupies a spot close to the pristine shores of Natai Beach. Containing a total of six bedrooms, Villa Baan Taley Rom is perfect for accommodating large groups of friends and families. The well-appointed bedrooms are decked in light colours and wooden fixtures, and provide guests with picturesque views of the tropical garden or boundless ocean. The commodious grounds of the villa boasts a variety of amenities, such as a spacious outdoor terrace, a sparkling infinity pool measuring twenty-five metres, a well-equipped gym and a luxurious spa pavilion. Guests will find plenty of cosy spots ideal for relaxation. Apart from the outdoor terrace, guests may settle down snugly at the ocean-facing balconies, or curl up on the pillowy chaise lounges by the poolside deck. Tropical living continues indoors, for the warm colour scheme and polished wooden flooring lend a homely and sunny touch to the interiors. The open plan design creates a sense of spaciousness indoors, and helps to draw cooling gusts of seabreeze into the villa. The well-constructed layout of the villa makes the best out of its scenic surroundings, as all the living areas and bedrooms open out into the manicured garden and overlook the beautiful coast. Mealtimes are a pleasurable experience at Villa Baan Taley Rom. Guests are seated comfortably around a large dining table which may be placed indoors, or outdoors on the covered terrace. For a special night, enjoy an intimate meal out in the verdant lawns or in the romantic Sala pavilion by the beach. The villa offer services to help you enjoy your vacation. Gardener and housekeeper will be there to keep your place tidy, while chef and massage available at extra cost. 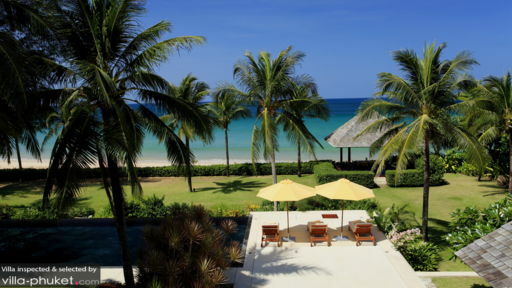 Situated along the serene and tranquil Natai Beach, Villa Baan Taley Rom is ideal for a peaceful getaway. Make the best out of your vacation here by doing absolutely nothing - lazy mornings should be spent indoors lounging on sunbeds, and leisurely afternoons are whiled away at the indoor spa room in the company of a professional massage therapist. At dusk, venture out to take a stroll along the powdery sands of Natai, before making your way back to the villa to enjoy sundowners at the outdoor terrace.